Cecilia Brunson Projects is pleased to present ‘Coraza’ by Lucía Pizzani. This new body of work has been developed over the last two years and from her recently completed residency at the Marso Foundation in Mexico. The title, ‘Coraza’ (translated – ‘armour’), references the ceremony to the Aztec god of rebirth, Xipe Totec. As part of the ritual to celebrate the start of the corn cropping season, Aztec priests would peel the skin from defeated warriors before donning their flayed skins. 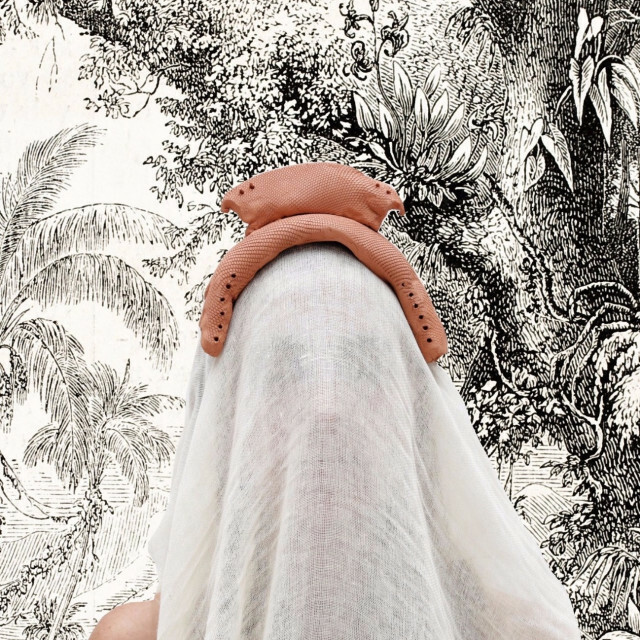 Pizzani became fascinated by the ancient ceremony, and this exhibition is her parallel exploration into regeneration, transformation and metamorphosis through ceramics, photography, installation, collage and video. In a new series of photocollages shown throughout the exhibition, Pizzani layers her own photographs of indigenous snake sculptures on top of amate paper – a type of tree bark paper that has been manufactured in Mexico since pre-Hispanic times. By syncretising medium, method and imagery, these photocollages allude to our own ‘Coraza’ – or as Pizzani calls it, ‘our second skin’. Pizzani has produced a series of darker ceramic sculptures that are meticulous, organic forms that twist, fold and coil, as if shielding and protecting something within. Each sculpture references Xipe Totec as they are either imprinted by corn – the symbol of renovation and harvest – or resemble the texture of a shed snake skin. Focusing on this motif of the shed snake skin, the four small photogram works are produced by taking the positive image of an amplified snake skin, then through a process of toning, turning the image from black-and-white, to the earthy sepia image displayed. The larger two canvas photograms are silkscreen prints of this photography-without-camera process. By using a palette of earthy colours and dark tones, Pizzani heightens sense of the organic and original materials used. Cecilia Brunson Projects would like to invite you to the private view brunch to celebrate Lucía Pizzani’s exhibition. Conversation with the artist and Pablo José Ramírez on the current and potential entanglements between contemporary art and indigenous cultural practices in Mesoamerica. Pablo José Ramirez: is a curator, art writer and cultural theorist. He has published extensively and has been member of different curatorial advisory boards and juries for institutions such as the Museum of Contemporary Art and Design (MADC), Gasworks, The Visible Award (Cittadellarte – Fondazione Pistoletto and Fondazione Zegna) and Teoretica. Ramirez has recently curated exhibitions for institutions and art spaces such as Display (Prague, 2018); the Museum for National Identity (Tegucigalpa, 2017); the Sheila C. Johnson Design Center, Parsons School of Design (New York, 2015); the Center for Contemporary Arts, CCA (Glasgow, 2014) among others. Ramirez is the former Artistic Director of Ciudad de la Imaginación (2010-2014) and in 2015 he co-curated with Cecilia Fajardo-Hill the 19th Bienal de Arte Paiz: Trans-visible. Ramirez is the recipient of the 2019 ICI/CPPC Travel Award.